These pasties are delicious. Portable, yet moist, they can be easily enjoyed on a train, late summer picnic, lunchbox, or my favorite: slightly toasted for breakfast. With the cinnamon icing, it’s like a giant pumpkiny pop-tart, and I mean that in the very best way (like your 12 year old brain remembers them). It’s also a more straightforward recipe than some, which require double baking the filling. Pair them with some cider, hot or cold, and they’re a must not only for your HP viewing parties, but also for all your autumnal gatherings. Cook’s Notes: Although I wrote these directions for the pie mold I own, it’s easily adapted to suit what you have. See the notes at the very bottom of the post for details. Preheat your oven to 350F, and line a baking sheet with parchment. Make your pastry dough: Mix together the dry ingredients. Rub in your butter, then add the egg yolk and enough cold water to bring the dough together. Set aside. Mix the filling: Combine all ingredients until they are thoroughly mixed. Set aside. Divide the pastry dough in half. Roll one half out to a thickness of about 1/4″. Use your cutter to cut out the desired shape. Fill with just enough filling that it won’t eek out the seams. Wet the edges with egg white, and cover with the top piece of pastry. Crimp the edges shut, and transfer the pit to the prepared baking sheet. Brush the tops of the pasties with a bit of egg white, then sprinkle with cinnamon sugar. Bake for 10-15 minutes, or until the edges of the pasties are golden. Remove from baking sheet and allow to cool completely! Make the icing: Beat what is left of your egg white until it’s frothy. Add the cinnamon and the confectioner’s sugar, 1/4 cup at a time, until the consistency is thick but drizzleable. If it becomes too thick, thin with a splash of water. Drizzle the icing over the cooled pasties, and serve! 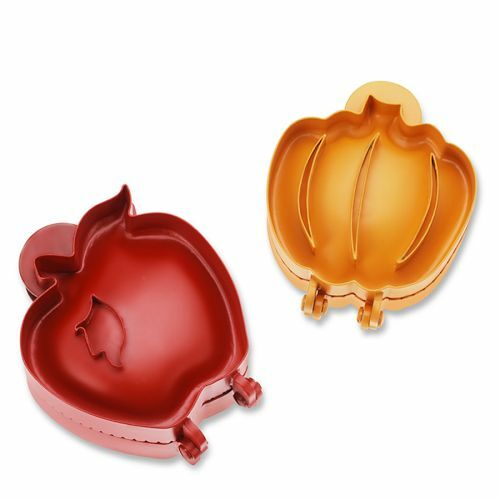 Note: I used a pumpkin shaped hand pie mold from William-Sonoma. I looked and looked online, but for the life of me couldn’t find them for sale anywhere anymore. Instead, I’d suggest this half circle style press from Amazon, which I also have. If you’d like to just fake it, you can use large circles of dough, and crimp the edges with the tines of a fork. Are these still sold anywhere? Amazing! 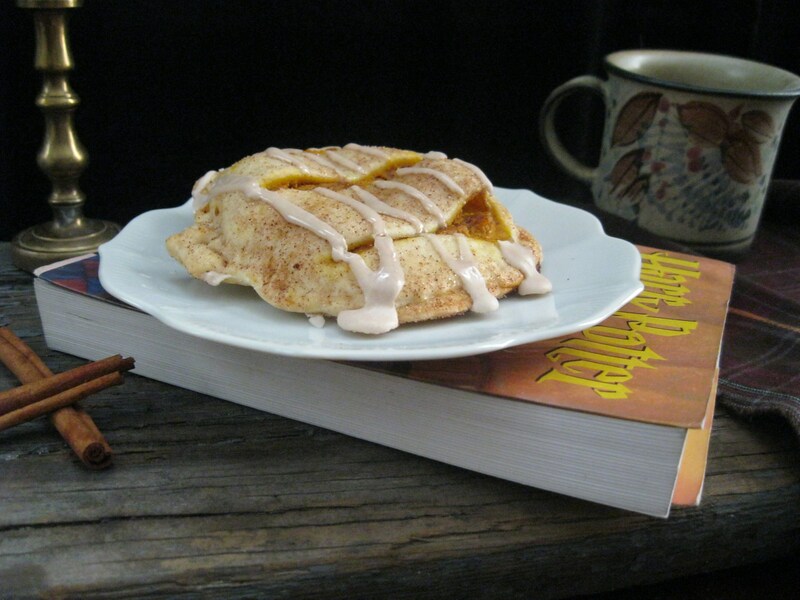 I love your Harry Potter recipes 🙂 And there is sooo much inspiration in there too! Also, I may have missed it, but about how many hand pies does this recipe make? The recipe makes about 10-12 mini pies, using that pumpkin shaped mold. For an empanada-style half circle, I imagine it would make more. I read that as an 11 pound can of pumpkin for a second there! Great work on this page I am a fan of your from the Inn at the Crossroads and love what your doing with the page! Thanks for swinging by from IatC! This looks delicious! I’m going to try to make them this coming weekend for Thanksgiving (yep, I’m in Canada!). What about a savoury version of Pumpkin Pasties? That was actually how I first imagined them while reading Harry Potter, before thinking of them as sweet. Pumpkin, onions, cheese…. mmm! Love reading your blog, and look forward to more! Any idea how much fresh pumpkin one would use? I just cooked my first pie pumpkin.